An especially interesting miniature, due to its quality. It is from, probably, the most classic locality for the species. 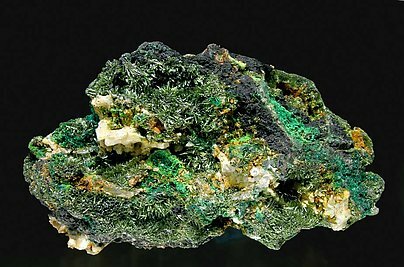 It forms botryoidal groups of bright and very intense and deep green crystals on a small matrix of Quartz. 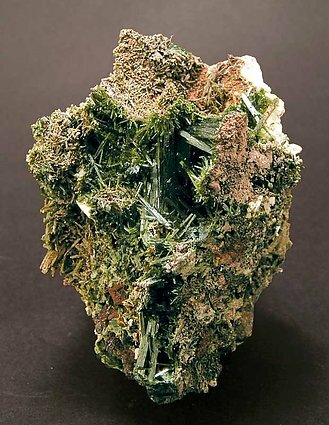 Acicular crystals reach a considerable length and form attractive aggregates on matrix. An interesting note to add is that the species was first described on samples from Cornwall. 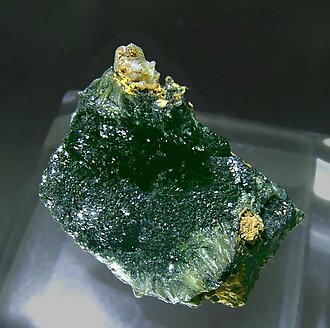 Aggregate of elongated crystals, a lot of them doubly terminated, with slightly curved faces and edges, with the olive-green color characteristic of the species and on matrix. A Cornish classic that is with two historical labels without reference to any collection that we will send to the buyer. Fine specimen of this rare arsenate. 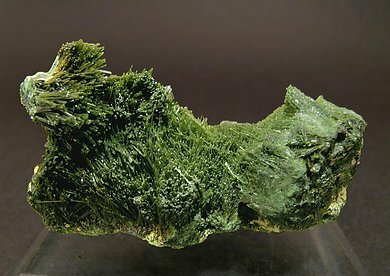 Acicular crystals are grouped in very definite aggregates, with the classic olive-green color for which the mineral is named, on a Quartz matrix. Cornwall is the type locality for the species. 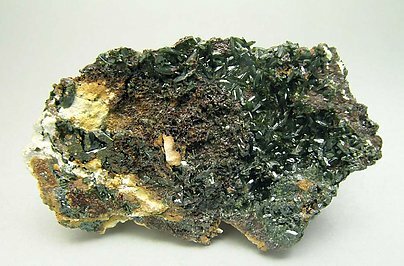 Aggregates, on matrix, of rod-shaped crystals, most of them doubly terminated, with an olive-green color, typical for most of the samples of the species. The sample has been analyzed and we will send a copy of the analysis to the buyer. 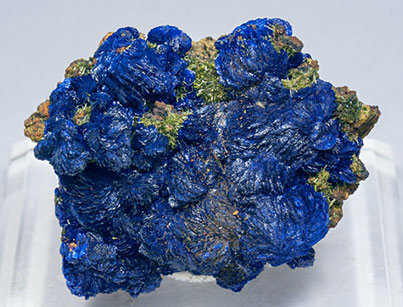 Very unusual, as are many of the samples from this collection. 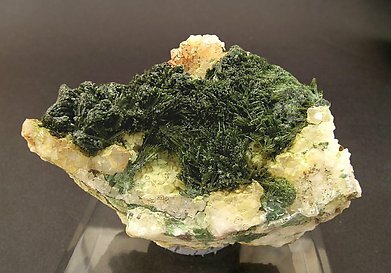 Aggregate of elongated crystals, a lot of them doubly terminated with their faces slightly curved, with the olive green color typical for the species and on Quartz matrix. A super classic from Cornwall. A novelty at Sainte Marie-aux- Mines 2016. 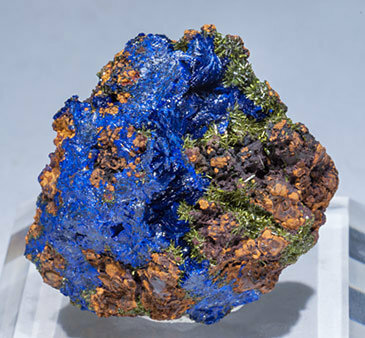 Aggregates of acicular Olivenite crystals, individualized or forming radial aggregates, with the olive-green color typical for the species, on limonite matrix and with rosette aggregates of lenticular Azurite crystals with a vivid and deep color. 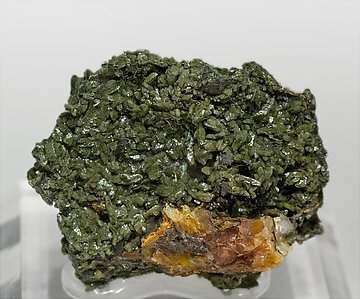 The Olivenite has been analyzed and we’ll send a copy of the analysis to the buyer. As usual with the Moroccan novelties, the locality is not yet completely confirmed, but it is very plausible that it is Tazalarht. 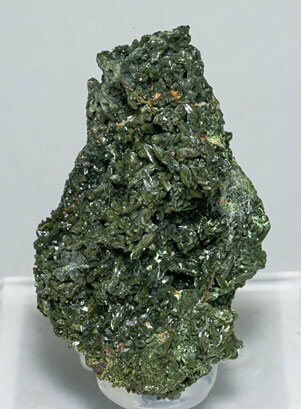 Excellent color Olivenite crystal aggregate with a good size for the species and the locality. 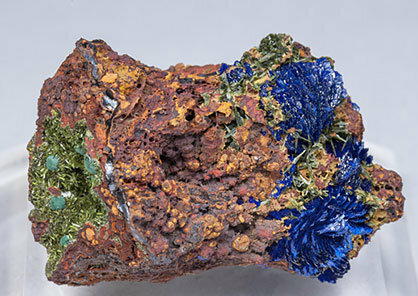 Accompanied by Malachite pseudomorphous after Azurite, also Azurite crystals with an excellent transparency and definition and green aggregates and concretions of Duftite. The Duftite has been analyzed and we will send a copy of the analysis to the buyer. 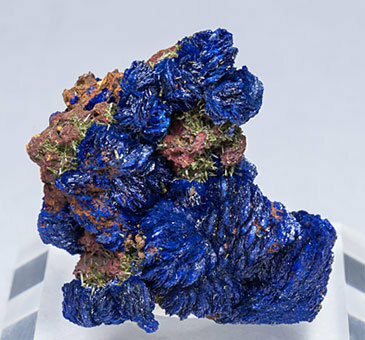 A high quality specimen from a classic locality. 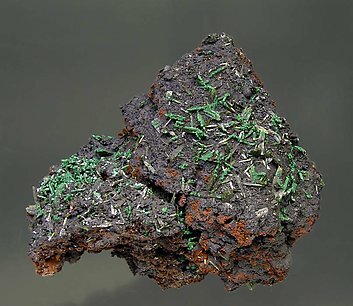 Groups of very acute Olivenite crystals, some of them doubly terminated, totally or partially covered by botryoidal Malachite and a color that contrasts with the dark Limonite matrix. The specimen comes from a locality not yet well known. Radial groups of acicular crystals with the olive color characteristic of the species. 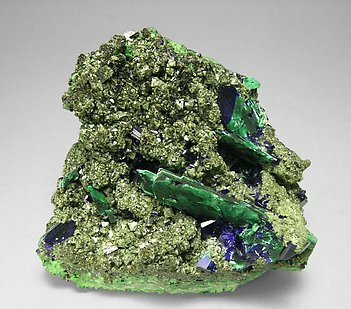 The sample also has concretions of Malachite and it is on matrix. The sample has all the virtues we love on best Folch’s specimens. Presence, classic taste and pedigree, enhanced by the labels of Sir Arthur Russell collection and, originally, from Lady Elizabeth Anne Coxe Hippisley collection. 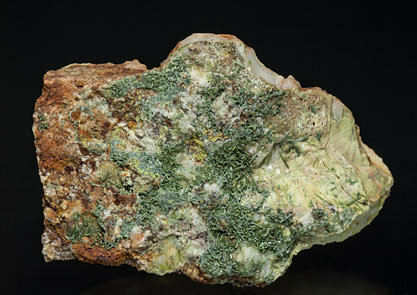 Classic acicular olive green Olivenite crystals, very bright, and on a rocky matrix with Pitticite. This specimen is accompanied by a handwritten Folch label and the collection card (Nr. 7344).